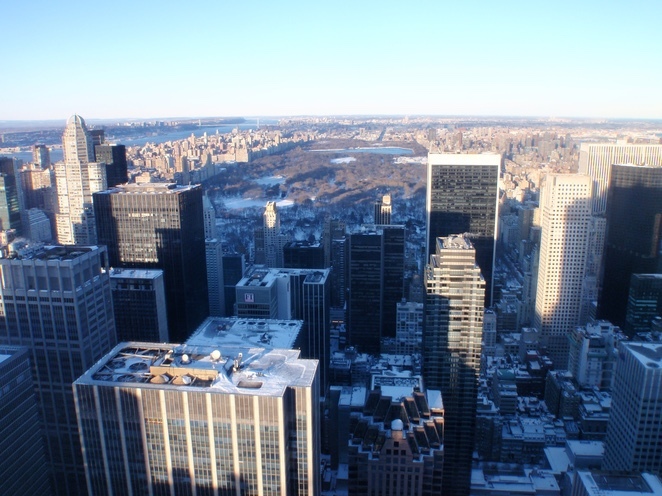 The view from the Rockefeller Centre 'Top of the Rock' which overlooks the Empire State Building. Photo by Jade Jackson Photography. With Christmas decorations in shop windows, charity Santas ringing bells on street corners calling out "Ho!, Ho!, Ho!, Merry Christmas! ", and the immaculately decorated Rockefeller Centre Christmas tree, it's easy to imagine why a Christmas in New York should be on your bucket list. 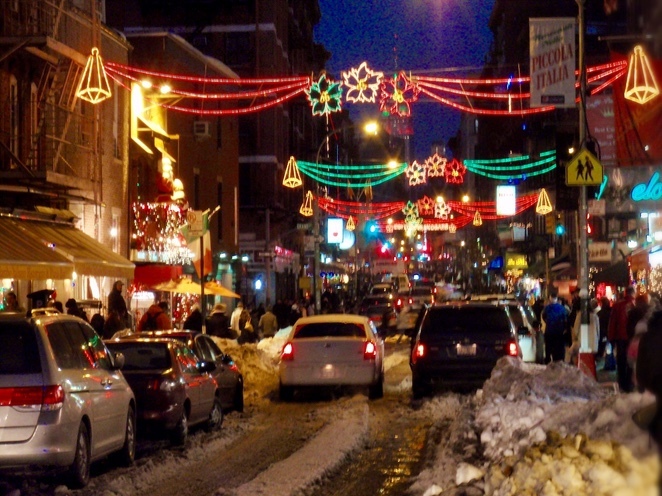 Christmas lights in Little Italy, New York City. Photo by Jade Jackson Photography. Christmas carols played seemingly everywhere, and lights adorning trees in the street all help to make a Christmas spent in New York feel exactly as you've seen in movies such as Miracle on 34th Street, Home Alone 2, Serendipity and Elf. Whilst it's not guaranteed to have a white Christmas, we were lucky enough to get a dumping of snow on Christmas night which was spectacular. Most snow in New York falls in January and February but occasionally it does snow over Christmas. Huge snow dump in New York. Photo by Jade Jackson Photography. Hotel accommodation in New York can be expensive but apartments offer great value, especially for families. We stayed in a centrally located apartment (West 49th Street and 8th Avenue) which was USD3100 for six people for twelve nights. Midtown Manhattan with Times Square. Image courtesy of Apple Maps. 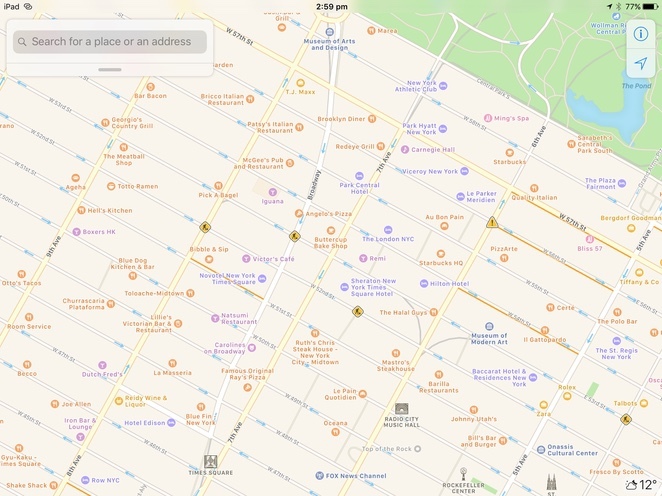 The apartment was small (as is common in New York) but included: three bedrooms, bathroom, a kitchen, lounge/dining area and was less than ten minutes walk from Times Square, fifteen minutes walk from Central Park and only a few blocks from The Rockefeller Center. There was a huge selection of restaurants and bars nearby and a large supermarket at Columbus Circle. New York Blizzard. Photo by Jade Jackson Photography. Most of our time was spent sightseeing rather than hanging out in the apartment. There were cheaper and larger apartments available, but these were out of Manhattan. Christmas tree shopping from the corner store in Manhattan, New York City. Photo by Jade Jackson Photography. What About A Christmas Tree? There are plenty of delicatessens and corner stores that have Christmas trees for sale, including the base to stand them up. We bought a beautiful real Xmas tree for about USD40 and picked up some decorations from the supermarket and department stores like Macy's and Century 21. Ice-skating in Central Park, New York. Photo by Jade Jackson Photography. On Christmas Eve we went ice-skating in Central park and tried to do last minute Christmas shopping at Macy's;-not recommended as it was chaos. Century 21 department store near the 9/11 Memorial and Museum was more managable and had great discounts on lots of top brand name goods. If you're wanting a Santa photo at Macy's, best not to leave it till Christmas Eve as it's the most popular time and Santa finishes early (in order to get all the presents delivered). Early morning is quietest and from November you can reserve a time slot online to meet Santa. Last minute shopping at Macy's on Christmas Eve in Manhatten, New York City. Photo by Jade Jackson Photography. Nighttime on Christmas Eve, we wandered around sipping hot chocolates and gingerbread lattes, mesmerised by all the Christmas lights and holiday window displays around midtown Manhattan. Ice-skating at Christmas Markets in Manhattan, New York City. Photo by Jade Jackson Photography. There are a few festive markets open on Christmas Eve (similar to European ones), where you can buy handmade goods, whilst nibbling on gingerbread and drinking mulled wine. We went to Union Square Holiday Market but there are others at Winter Village, Bryant Park, Grand Central Holiday Fair, and Columbus Circle Holiday Markets. We finished the night gazing in awe at the immaculately decorated Rockefeller Centre Christmas Tree, before sitting under our own Christmas tree, watching the classic movie It's a Wonderful Life. Rockefeller Center Christmas Tree in New York City. Photo by Jade Jackson Photography. Waking up to see Santa had found us in New York was truly special. We spent Christmas morning opening presents under the tree whilst listening to Christmas carols. Christmas Day Service at St Patricks Cathedral, Manhatten, New York City. Photo by Jade Jackson Photography. 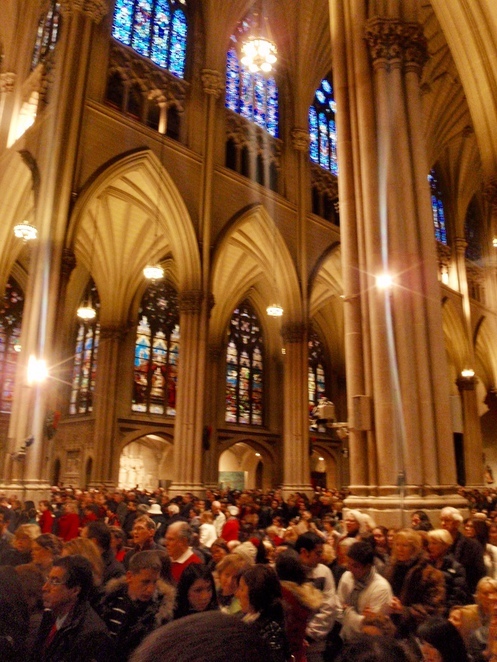 Even if you're not the religious type, attending a Christmas morning service at the iconic St Patrick's Cathedral (on 5th Ave) is a gratifying experience. It was standing room only and the acoustics of the stone building meant the choir sounded like angels. Nearby the Radio City Music Hall hosts the annual Radio City Rockettes Christmas Spectacular which is a dazzling display of red, glittery costumes on long legged beauties singing Christmas themed tunes. They're most famous for their perfectly timed flared kicks all in unison. Sure it's kitschy but it's fun and there's a reason it's called 'spectacular' with some performers kicking up to 1200 times in a day. * The show is one of the few places open on Christmas Day. TIckets can be bought from the Radio City Music Hall box office. *Source Radio City Music Hall website. If you buy a New York Pass, it includes a behind the scenes tour of Radio City and you get to meet a Rockette! On Christmas night we ate a scrumptious roast ham and turkey dinner we had baked followed by more Christmas movies on television. Are the Boxing Day sales better in New York? The Boxing Day sales had big discounts but mostly on selected stock. We had a blizzard on Boxing Day which hampered our shopping expedition. However we found the outlet malls to be much more enticing and every major city has one on the outskirts of town. The reasonably strong Australian dollar, cheap cosmetics, electronics and clothes would definitely be a reason to leave your Christmas shopping till you arrive in the USA, if you have time. A unique Christmas gift is a Broadway theatre ticket, which then gives you something to do on Boxing Day. There are limited performances during the holiday week. For cheap theatre tickets check here. Central Park with snow in New York. Photo by Jade Jackson Photography. Overall Christmas in New York is just like in the movies with decorations, lights, and Christmas carols everywhere, even without snow, it's a magical place to be during the holiday season. If you're in New York for New Year's Eve and plan on watching the ball drop in Times Square, read this article. For time saving tips to make the most of your New York trip, check out this article. Why? Christmas in New York is a magical experience. Phone: (0011 1) 800 2255 697 Phones are manned local business hours in New York which is 14 hours behind AET. Cost: Cost varies depending on standard of accommodation, and length of stay.